It’s auction week in Arizona and that means there are a lot of fantastic cars of for sale and the prices continue to skyrocket. This year I had planned on sharing all the cars that were half a million dollars or more up for sale, but there are just too many. So I moved the scale up to, as Dr. Evil would say, one million dollars, and there are still 51 available. They’re all worth looking at. And, if the descriptions are true and the auction houses are honest, all these cars are worth every penny. So if you have a million dollars or more burning a hole in your pocket, you might want to head online, or better yet, to Arizona this weekend and pick up one of these cars. You won’t be sorry. 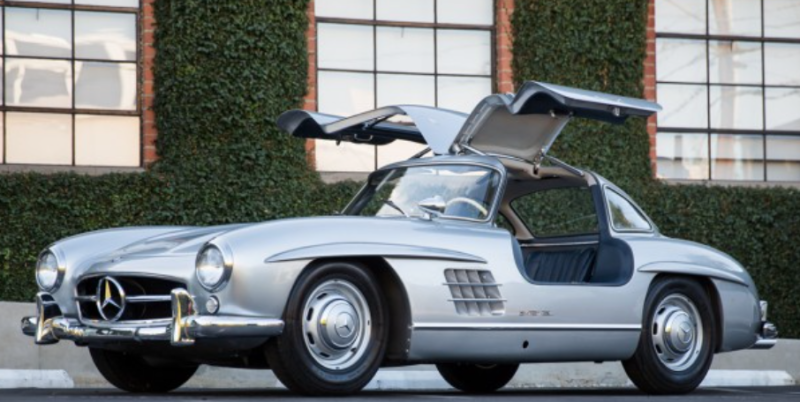 Restored 300 SL Gullwings dominate today’s market, and they are wonderful automobiles. There is something to be said, however, for an automobile that has been selectively refinished only as necessary over the years, preserving so much of its original authenticity and character. It reminds the connoisseur of what once was, the Gullwings of the “enthusiast era” in the 1960s and 1970s when they were all broken-in drivers. The car offered is one such example, and it awaits a new owner to enjoy it as-is, with all of its considerable charm intact, in an era of enjoyment, born anew. With only 34 examples produced over the course of the car’s production run, the 5000 GT is one of the most compelling cars ever produced by Maserati. Perhaps the most illustrious automobile to wear the trident, it was an automobile reserved for the most select individuals for whom only the best would do. Today, AM103 040 is said to present very nicely, and its restoration has held up well over the years. Due to its significance, rarity, and overall importance to the marque, it will certainly attract both attention and admiration wherever it goes. Before the introduction of the Lamborghini Miura at the 1966 Geneva Salon, the term “supercar” simply did not exist. The Miura heralded the beginning of a new age in automotive history, and visually, it looked like nothing else on the road. The designer, Marcello Gandini, was just 27 years old when he penned its stunning design for Bertone, and his work encapsulated the youthful spirit of the age and the power lying behind the bodywork. The Miura’s design was indebted to its engine placement, with the V-12 mounted transversely directly behind the passenger compartment. Not only did this allow for a highly attractive silhouette, but it also gave the Miura incredible balance and weight distribution. Like many supercars that have followed in its footsteps, the Miura evolved over time, and the last iteration, the P400 SV, was the most developed and potent. 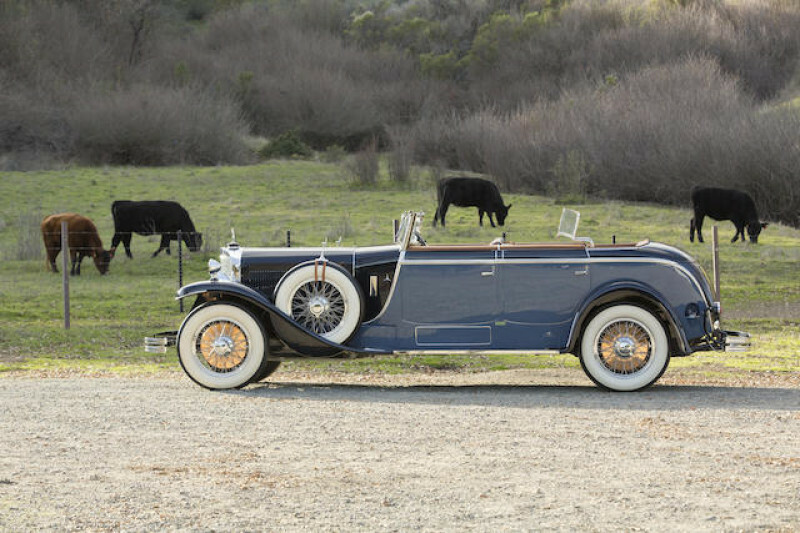 The most well-known design of Pasadena, California, coachbuilder Walter M. Murphy on Duesenberg Model J chassis is the Disappearing Top Convertible Coupe, of which about 25 were made, all featuring a distinctive convertible top that hid neatly within the rear smooth deck when lowered. Yet, there is a rarer of beasts, the Disappearing Top Torpedo Convertible Coupe, which is considered by many to be the utter pinnacle of Murphy’s work on Duesenberg chassis. It combined the standard convertible coupe’s lines with the flowing tapered rear deck of a “boattail” speedster, often finished in bare aluminum that extended forward through the beltline and down the center of the car’s cowl, giving an extra touch of sparkle in the California sun. Few Duesenbergs so beautifully combined the marque’s performance ethos with the glamour of a status symbol. Accordingly, the Disappearing Top Torpedo Convertible Coupe has become one of the most remembered and revered of all the company’s creations and is among the most hotly desired by enthusiasts worldwide. 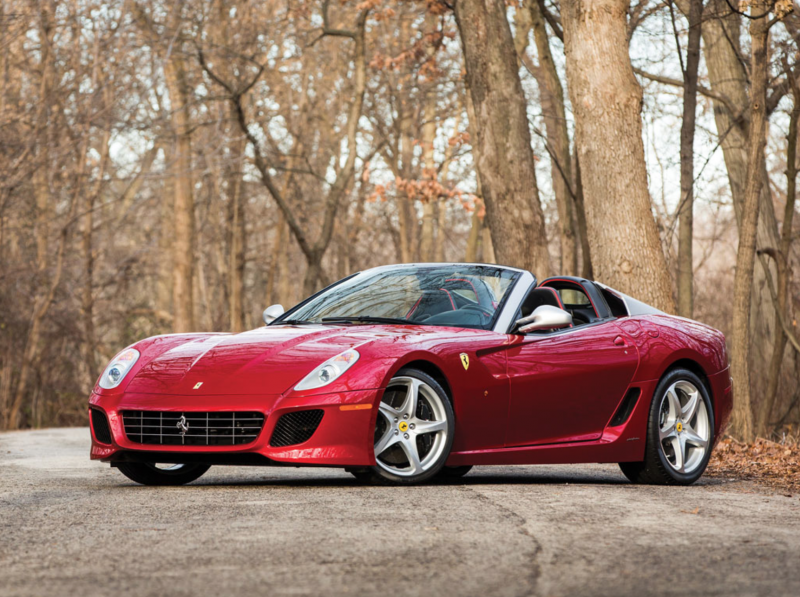 The 599 GTB Fiorano, produced from 2006 to 2012, replaced the 575M Maranello in Ferrari’s lineup as the brand’s two-seat flagship model. Styled by Ferrari’s Frank Stephenson under the direction of Pininfarina, the 599 debuted at the Geneva Motor Show in February 2006. Like the 575 and the 550 Maranello before it, the 599 model range would also be joined by a limited edition, open-top variant, the SA Aperta. The limited production of just 80 models was in homage to the 80th Anniversary of Pininfarina. Finished in the hugely desirable and extra-cost exterior color of Rosso Fuoco with a Nero top and leather interior with special thick stitching, it goes without saying that this 599 SA Aperta is instantly recognizable as one of Maranello’s finest. Classiche certification is included, along with its books, records, and tools. This is a rare opportunity to purchase a modern-day, limited production Ferrari. Despite their success in racing, Maserati’s future looked uncertain in March of 1957 when the new 3500 GT coupe was introduced at the Geneva Motor Show. Simply put, Maserati had too much on its plate with entries in a trio of different sports car classes as well as Formula One racing. Maserati needed a commercial success in the form of a road car in order to continue funding the company’s racing exploits and to keep its head above water. The 3500 GT was intended to do just that. 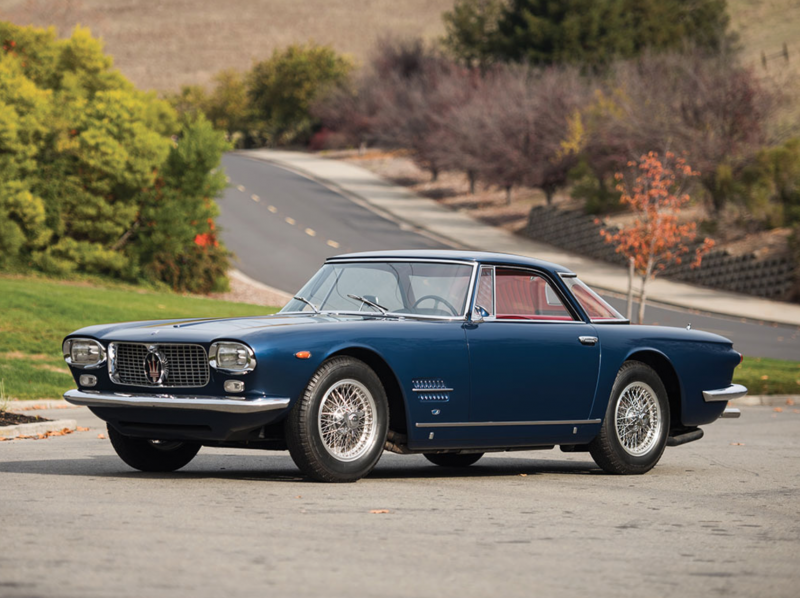 Utilizing the company’s proven inline six-cylinder motor that now had 3.5 liters of displacement, the car delivered at a time when it was needed most and proved to be the success Maserati was looking for. Nearly 2,000 examples were produced over the course of eight years, a massive number for a company previously known for their hand-built, low-production sports cars. Distinctly different from the production 3500 GT spyders, chassis number AM101 505 would be the perfect acquisition for the individual looking for a very special open Maserati. The Cobra presented here, chassis number CSX 3010, is the 10th chassis number of only 23 427 Competition Cobras built by Shelby, which are considered by many to be some of the most desirable Cobras in existence. It was built in early 1965 and invoiced to its first owner, Don Russell Jr. of Colombia, South Carolina, son of the state’s then-Governor, Donald S. Russell. According to the fourth edition of the World Registry of Cobras and GT40s, CSX 3010 was fitted with a less aggressive exhaust for street use, a shoulder harness, and road lights. 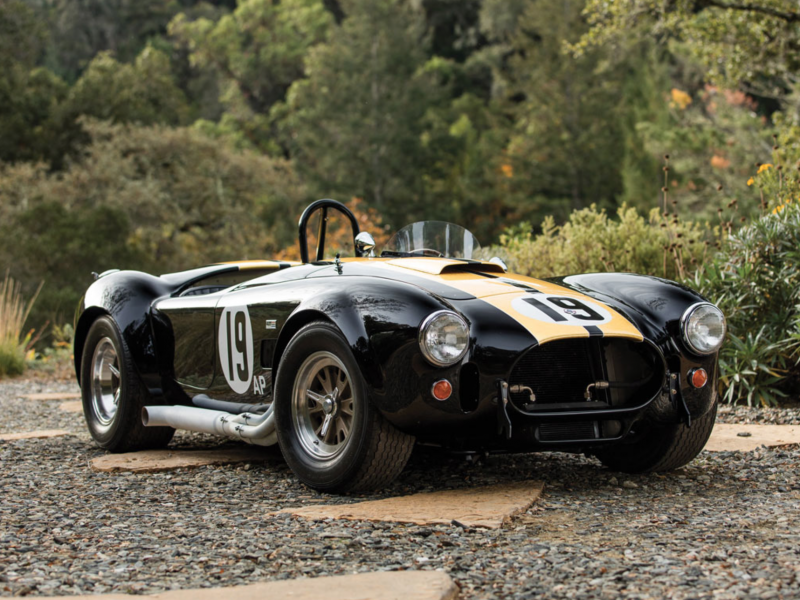 The 427 Competition Cobras have always been the most desirable Cobras ever built, and ownership of one of these true 427 Competition Cobras is a dream of many Shelby enthusiasts. With an unmatched competition history and offered in its current state as a dual-purpose vintage racer and grand tourer, CSX 3010 is indeed the ultimate enthusiast’s Cobra. By 1963, it had become increasingly apparent to Ferrari’s engineering team that the long-running and highly successful 250 GT series of road cars had reached the end of its development potential. Despite the fact that Ferrari was slowly drifting toward a more luxurious base-V-12 car, the company still wanted to maintain its fine tradition of dual-purpose sports/racing cars, which had cemented its considerable sporting reputation. Renowned British racer Michael Parkes, at the time a Maranello Works driver, participated in considerable testing and proved to develop a replacement model for the 250 GT platform, one that ultimately drew considerably upon the 250 GTO, with its long front hood and short rear deck. The resulting 275 GTB, or Gran Turismo Berlinetta, debuted to great acclaim at the 1964 Paris Motor Show, appearing in tandem with a companion open-top spider version. 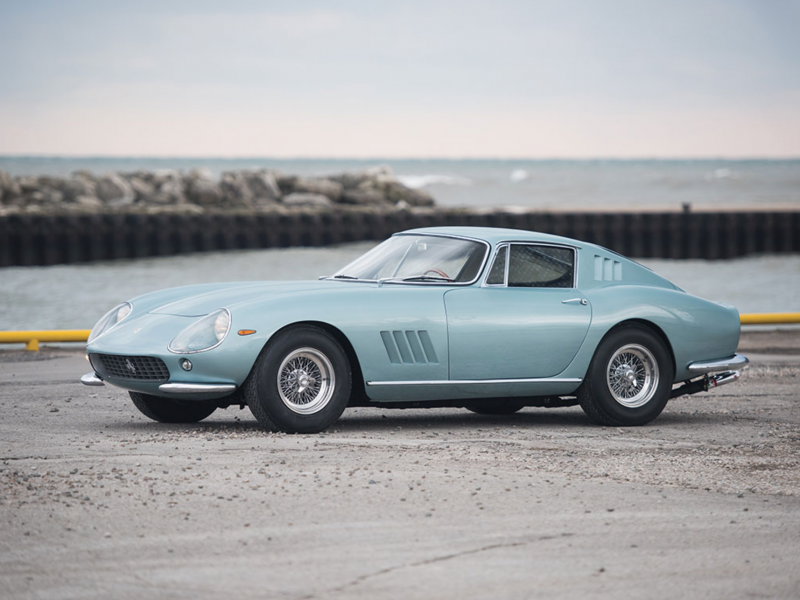 A highly attractive and interestingly optioned 275 GTB, this Classiche-certified example would be a beautiful addition to any collection of the finest modern sporting cars. 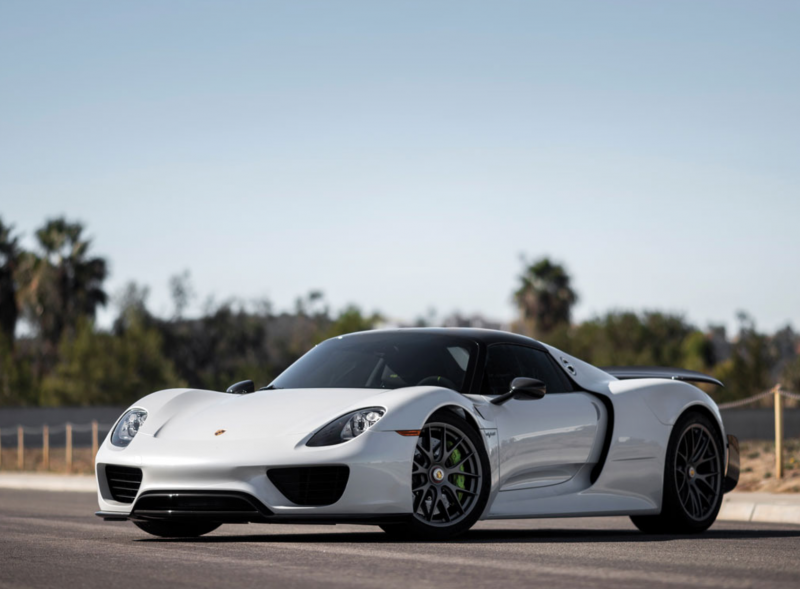 Produced in late 2014 as a 2015 model, this particular 918 Spider is an incredibly highly optioned example. First and foremost, it is outfitted with the desirable Weissach package, further increasing its performance. Its exterior color is a “paint to sample” Metallic White that is unavailable as a standard color, and the interior is Black with Acid Green highlights with Alcantara and seat belts with matching Acid Green accent stripes. Furthermore, the car is fitted with the front-axle lift system, the glare reducing interior package, automatic air conditioning, Porsche’s wonderful Burmester surround sound stereo system, and the optional cup holder. Presented with the Weissach package and in a paint-to-sample color scheme, this is a true collector-grade 918 and an automobile that any Porsche collector should strive to own, as it continues Porsche’s wonderful tradition of automotive innovation coupled with world-beating performance. 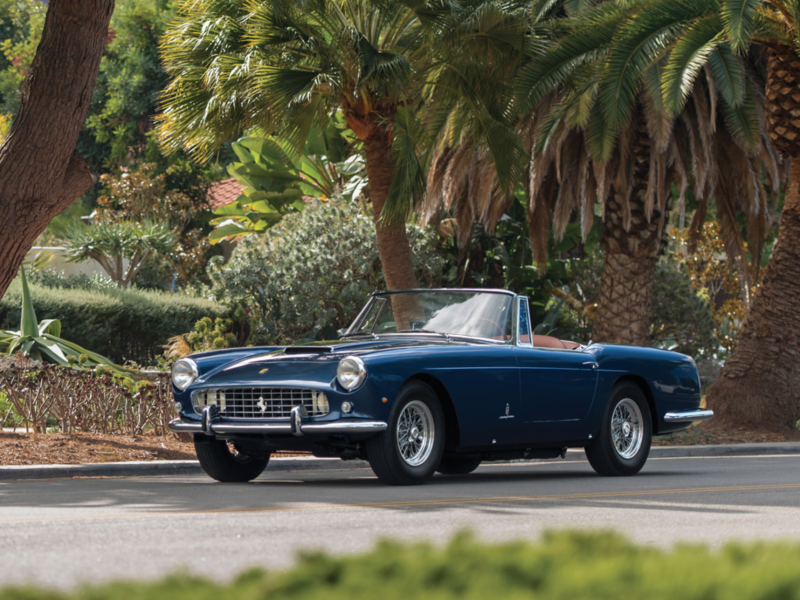 Intended for a different customer and style of driving than Ferrari’s other open-top offering, the 250 GT California Spider, the 250 GT Cabriolet was not intended to channel the emotions and driving style of Ferrari’s thoroughbred racers. This was a true gentleman’s Ferrari designed for high-speed touring in comfort. With the performance one would expect from Maranello’s finest, the 250 GT Cabriolet gave no concessions to luxury and was exquisitely trimmed and appointed to please Ferrari’s demanding clientele. With a spacious boot that could hold more than enough luggage for two for a long-weekend trip, this was the ideal touring car for the California coast or the south of France. 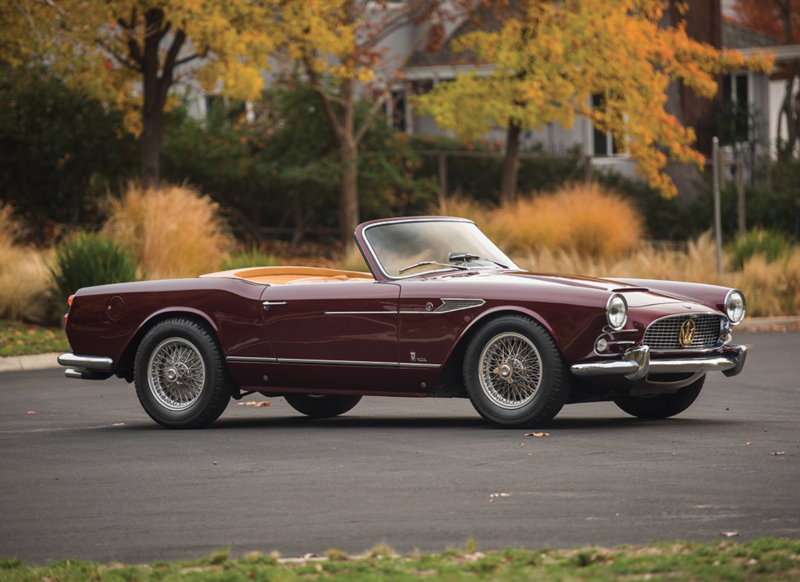 Often overlooked for the more aggressive California Spiders, the 250 GT Series II Cabriolet is a wonderful car in its own right, stately, sophisticated, and full of character. 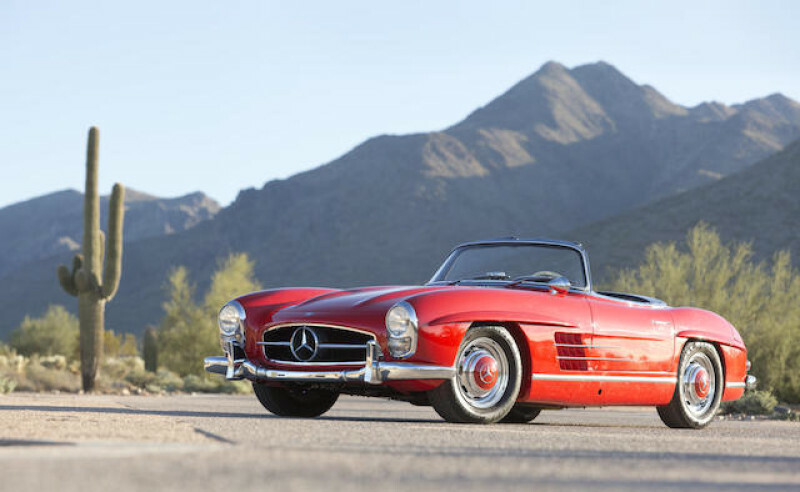 The 300 SL Roadster offered here is an early-production model, hailing from the beginning of the 1957 production run. It is equipped with some of the most desirable features of this model, such as a body-color removable hardtop and the European-specification headlights, which are widely considered more attractive than the sealed-beam units used on U.S.-delivery cars. The car is an older cosmetic restoration, with the body finished in silver with a beautiful red leather interior. 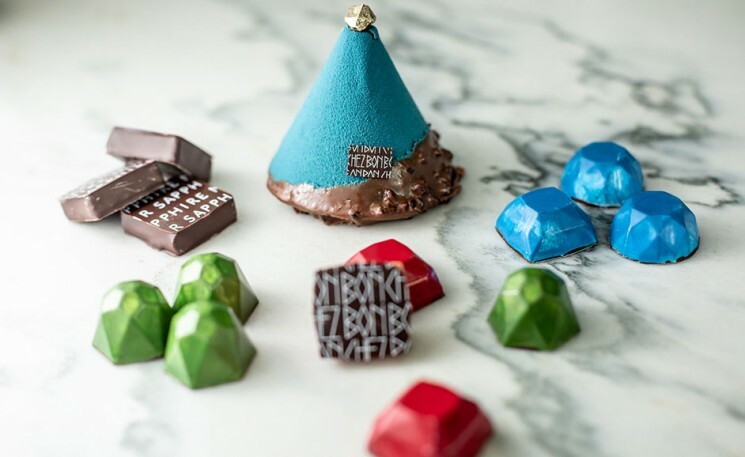 Consistent in its presentation, it shows only minor age and use throughout. It displayed 66,353 miles at the time of cataloguing. The owner notes that the engine was rebuilt by his professional in-house mechanic to factory specification within the last several years. A nice driver that would be entertaining for Arizona desert roads, this beautiful early 300 SL Roadster would be a happy addition to any collection of sporting automobiles. The Type 959 was Porsche’s first true “supercar,” a design to which every imaginable accolade has been applied. Based on the company’s evergreen 911 sports coupe, it was built to win the FIA’s Group B World Rally Championship and, not incidentally, serve as an all-wheel-drive development platform for Porsche’s future 964 production series. The “Gruppe B” prototype was introduced at the 1983 Frankfurt auto show, where it stunned onlookers with advanced technology that included a chassis built of advanced lightweight materials, a rear-mounted, 2.8-liter turbocharged engine, and a mind-boggling array of electronic engine and suspension management systems. 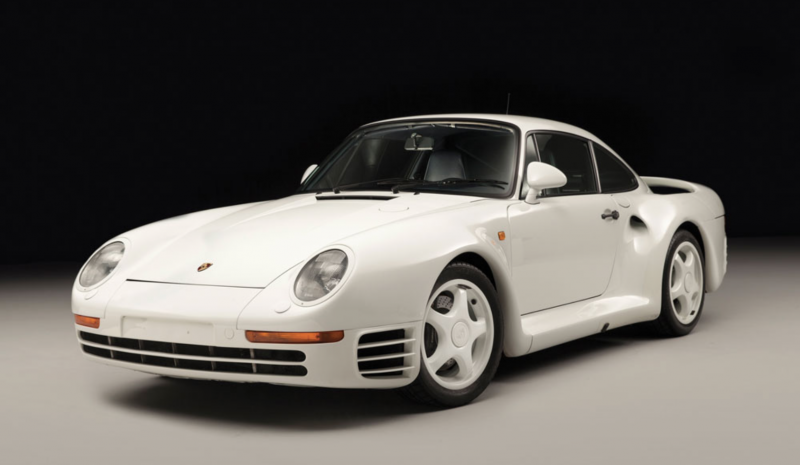 Even by today’s standards, Porsche’s 959 is one of the automobile world’s true wonders—very fast, well-built, and extremely rare. This well-documented example would please any thoughtful collector. Although Enzo Ferrari built his reputation upon the success of his sports racing cars, it was the financial success of his road cars that his company relied on for continued success in racing. As the company grew, the two sides of Ferrari were inextricably linked; one could not prosper without the other. 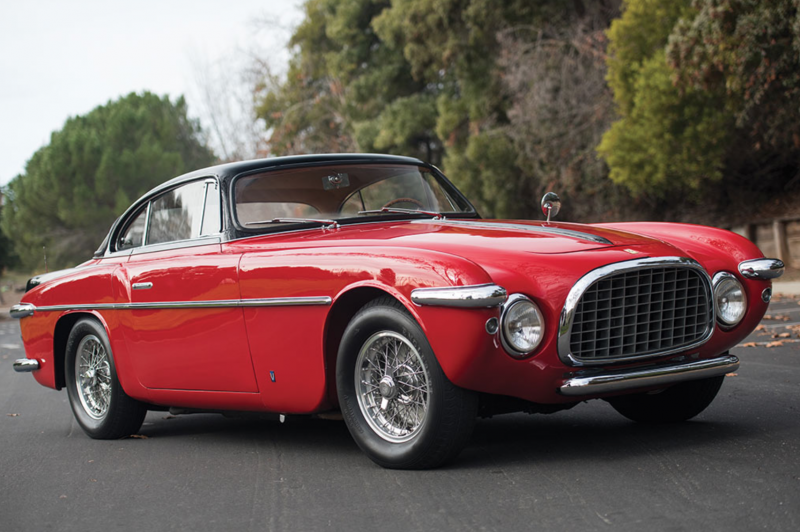 Completed in early 1953, chassis number 0285 EU, the 212 Inter by Vignale presented here, was finished in Rosso with a Nero roof over a Beige interior, the 23rd of 26 of the 212 Inters built with Vignale coachwork. It was immediately shipped to Luigi Chinetti’s New York distributorship and was sold through Chinetti to Pennsylvania State Senator Theodore Newell Wood. Ferraris of this age are seldom seen in such a state of preservation, and many of those are quickly whisked away to restoration shops to be prepared for a grand unveiling at one of the world’s major concours events. This car is one of few “survivors” presented in unrestored condition and, as such, would surely be a welcome sight in the preservation class of any concours worldwide. 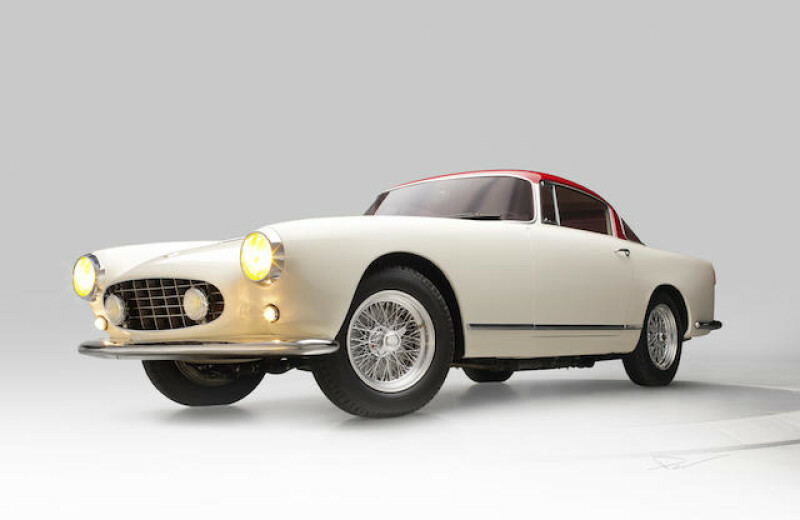 The third Vignale-bodied C3 built, this car demonstrates the continuous detail changes made to the cars, both as the result of customer desires and ongoing design improvements. It was fitted with flat side windows with rear quarter windows, bumper overriders, and a checkered flag badge on the engine cover, features used on all C3s from this point forward. The wheelbase was 105 inches, a change made from the previous chassis (number 5207) forward, and the car was equipped with a 20-gallon fuel tank, a Ford radio, and a heater. The body was finished in three shades of silver-blue, a distinctive and unique tri-tone color scheme believed to have been used only on this car. Today, finished as near as possible to its original Cunningham specification, this car is the only Vignale-bodied C3 to have raced in period and is now one of the finest its existence. Certainly one of the most familiar C3s in period, it is ready to enjoy the care of a new owner—and to entertain on the road or perhaps even the track. According to history that has long accompanied this car, SS 100 Jaguar chassis number 49064, the last 2½-Litre chassis built in 1939 per the Jaguar Daimler Heritage Trust, was purchased by Van den Plas as a basis for a custom body prior to World War II. The war prevented the project from continuing, and the chassis managed to survive the conflict. Thus, when it came time for Van den Plas to return to coachbuilding, they looked to the only chassis they had readily on hand as the basis for their first show car, an all-important creation that would hopefully attract new business during the lean immediate post-war period. One of the most significant surviving examples of Belgian coachbuilding, the Van den Plas SS 100 is joyfully something more. It was the announcement at the end of war that glorious new things were to come, carried out in sporting engineering and fluid curves. The introduction of the 275 series marked a significant milestone in Ferrari production, as the manufacturer introduced two of its most seminal models. Featuring a newly enlarged version of the classic Colombo short-block V-12, which now displaced 3.3 liters, the 275 GTB and GTS rode identical chassis that were internally coded Tipo 563, with its new engine, the Tipo 213. For the owner that might wish to indulge in open-top performance and the loud chorus of 12 Maranello cylinders, the well-sorted V-12 engine beckons for stomps of acceleration out of the turns of twisting vistas. Chassis 07935 is a highly desirable example of one of Pininfarina’s most successful open designs, and it would handsomely complement the collection of any Ferrari enthusiast or sports car aficionado. 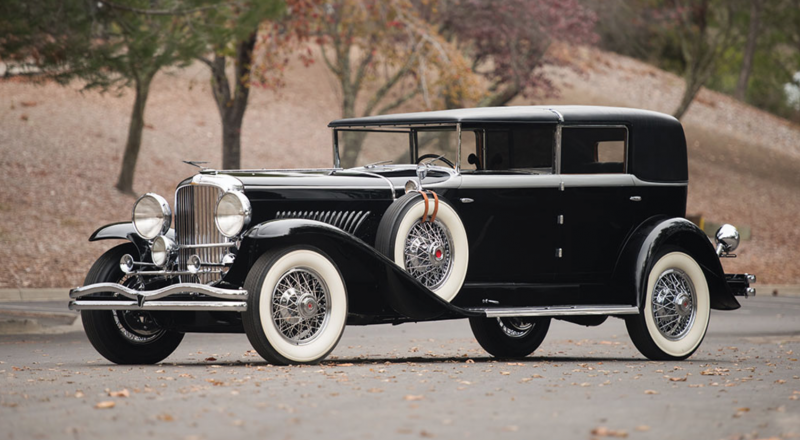 While the Duesenberg Model J’s production run is often quoted as being from 1929 to 1937, the majority of the chassis were in fact built in 1929; during the Depression it simply took the rest of the company’s existence to sell them. Accordingly, chassis 2531 and engine J-295 were not dispatched to one of Duesenberg’s factory branches until March of 1934, when they were sent to Philadelphia. Here, the new chassis was fitted with its original body, this Murphy Town Car, which is one of only six built. As by this time Murphy had been out of business for nearly two years, the body is likely to have been one remaining example finished “in the white,” or removed from an earlier chassis and reconditioned for a new owner. 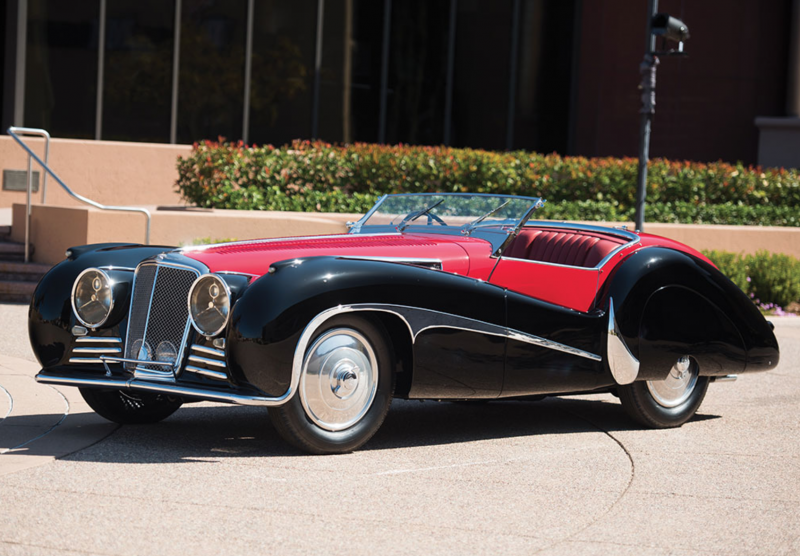 The Murphy Town Car is among the most elegant of the formal Duesenbergs, and “Dorrance,” as Bayard Badenhausen has dubbed it, is a splendid survivor. To say that the Mercedes-Benz 300 SL was ahead of its time would be an understatement. The 300 SL heralded a new era for Mercedes-Benz road cars; it utilized an innovative space-frame chassis coupled with a race-bred, fuel-injected engine, the first of its kind fitted to a production car, and was clothed in breathtaking bodywork. An attractive and elegant 300 SL roadster, with interesting history and in one of the best imaginable liveries, this car would take pride of place in any collection of modern sports cars. It is certain to be as thrilling to drive as it is to look at! Before the Enzo, the F50, and the F40, there was the 288 GTO, Ferrari’s original smiling gift to its best customers and devoted connoisseurs. It was born from the FIA Group B race and rally homologation regulations introduced for 1984, meaning that, like so many great racing cars through time, it was built for the public largely so that racing versions could take to the track. The result was a true supercar without compromises. Some of the world’s original “supercars” have had their luster dulled by time. 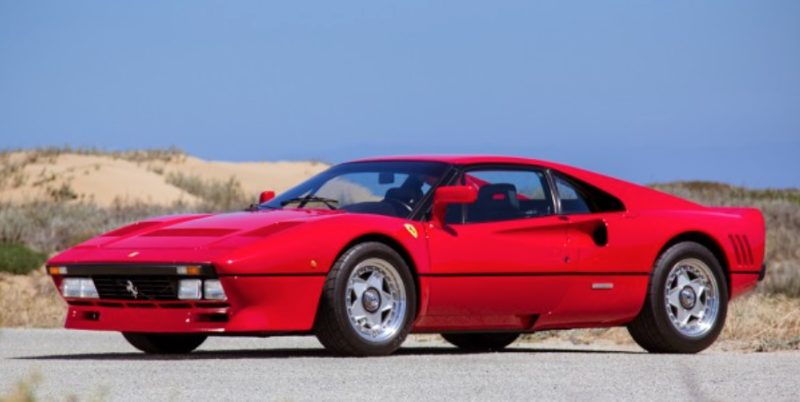 The 288 GTO, the Ferrari supercar from which all others after were born, is different. It has survived the passing years as something still as advanced and exciting as the day that it was built, and in doing so, it has truly captured the spirit of its venerable forefather. The Mercedes-Benz 540 K was one of the most prestigious and, in the eyes of many, the most beautiful automobile of the interwar years. Its combination of power, light weight, and sheer beauty made it the master of the road, and it was a testimonial to the astonishing capabilities of the German automotive engineers of the day. It was also breathtakingly expensive, guaranteeing exclusivity among its owners; just 419 chassis were built, and of those, only a handful carried the superlative longtail Spezial Roadster coachwork that may well have been the high point of the coachbuilder’s art at Mercedes-Benz’s own Sonderwagenbau in Sindelfingen. This Super Sprint Zagato claims a magnificent restoration to factory standards and a fascinating early life associated with one of Italy’s lesser known (but best connected) racing concerns, the Scuderia Madunina. According to the records of Alfa Romeo, as well as the research of 1900 authority Peter Marshall and Italian car expert John de Boer, chassis number 01909 was completed on July 29, 1954. 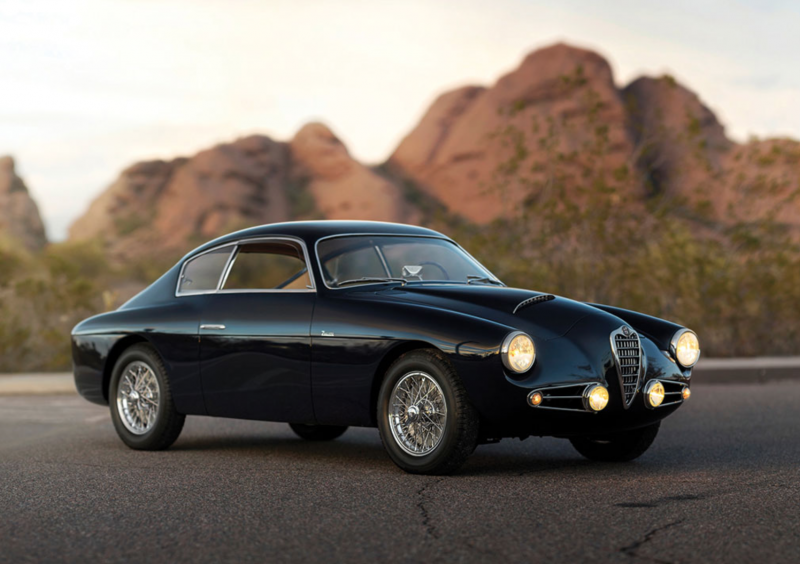 As Zagato records indicate a date some months later, it is fair to assume that the Alfa factory information represents the date the chassis was completed and prepared for shipping to Zagato. 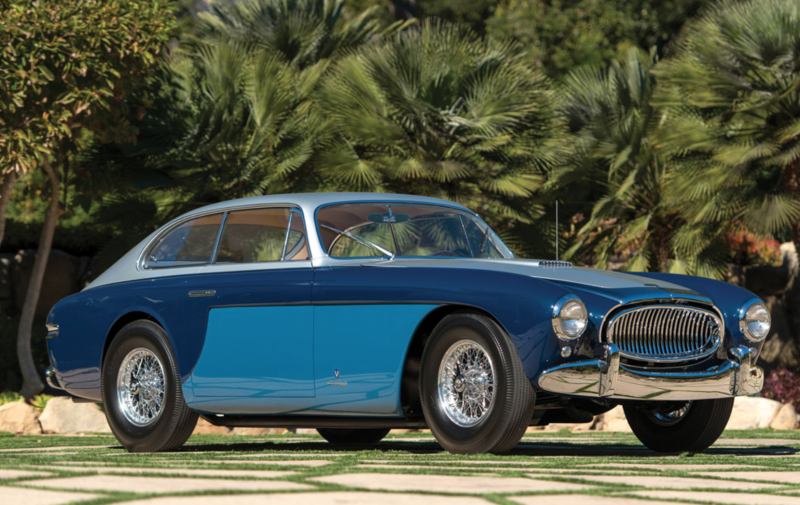 Michele Marchiano’s seminal book on the coachbuilder, Le Zagato – Fiat 8V, Alfa 1900 SSZ, clarifies that 01909 is the 16th example of the 39 cars bodied as coupes. 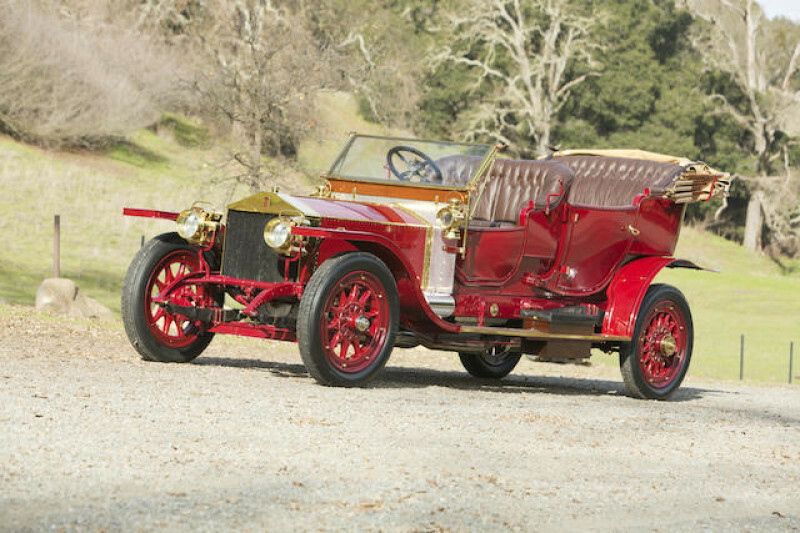 As one of the most expertly restored examples offered in many years, 01909 should be warmly welcomed at important concours d’elegance and will constitute an important addition to any collection. 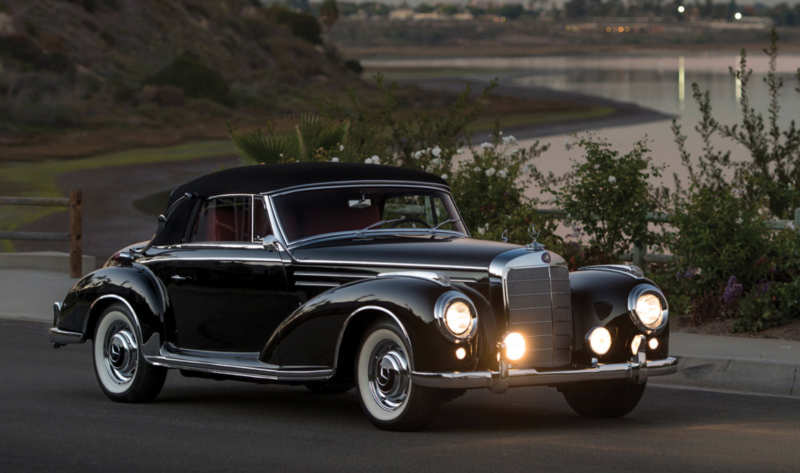 Introduced in April of 1951 at the first-ever Frankfurt Motor Show and later that year in October at the Paris Motor Show, the 300 was to be the crown jewel in the post-war Mercedes-Benz crown. The 300 was initially offered in cabriolet and saloon models on the W186 chassis; however, the shorter and sportier W188 chassis would also be used to provide customers with roadster, coupe, and cabriolet versions. Featuring an independent suspension, the 300 provided outstanding comfort, even when cruising at a maximum speed of 100 mph. The car is offered with a variety of ultra-desirable additions, including the original keys, luggage set, and tool kit. It is a scarce opportunity to acquire a high-quality example of one of the rarest post-war Mercedes-Benz vehicles and, arguably, the pinnacle of the 300’s evolution. Most famous as the longstanding coachbuilder to British royalty and a favorite of Rolls-Royce Ltd., Barker frequently produced coachwork of fine quality and conservative mien. Occasionally they would throw off their razor edges and build something that was really dramatic and spectacular, most prominently for London Motor Show exhibits. The 1930 show introduced a two-passenger Phantom II, chassis number 92 GY, wearing a body that would have looked advanced 10 years in the future. By 1930 standards, it was a tremendous leap ahead and an exceptionally beautiful and interesting one as well. 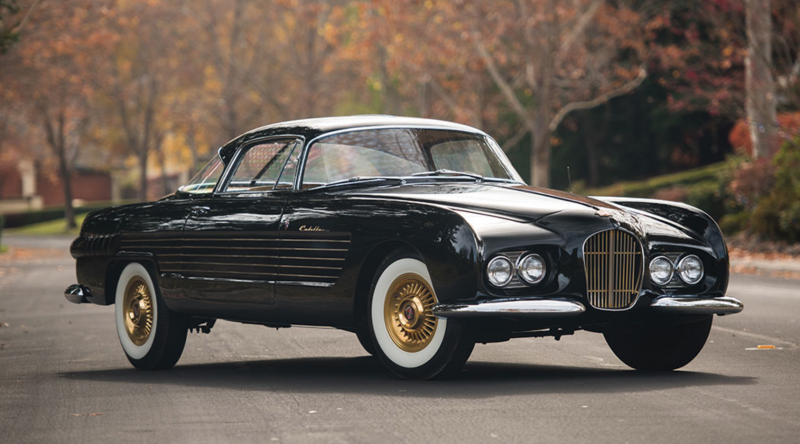 The car is offered with copies of its original build and historical information from the Rolls-Royce Foundation, as well as additional research performed into its ownership history. It is featured in Automobile Quarterly, volume 27, number 2 (p.192), and in the well-known reference work of Lawrence Dalton, The Derby Phantoms (p. 204). Phantom IIs are all unique automobiles, and many aspired to reach beyond the elegant to the sporty. Few succeeded as well as this absolutely dashing motor car, a dramatic conveyance for two or four that dramatically announces the arrival of the streamlined age—in silence. Success to European automakers after World War II meant success in the United States, where American currency was free-flowing in the post-war boom economy. 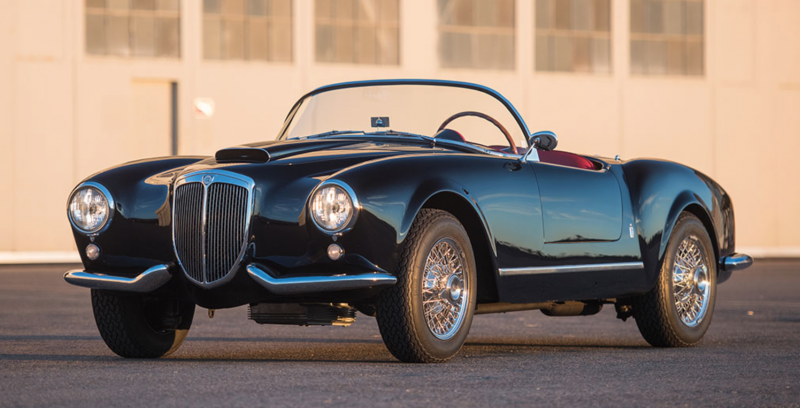 Lancia’s entry was a proper two-seater open sports model of their modern Aurelia, featuring the world’s first production V-6 engine, with a balanced transaxle and inboard rear brakes. Known, appropriately, as the Spider America, the new model was built on a shortened chassis with beautiful Pinin Farina styling, including a dogleg wrap-around windshield, no external door or trunk handles, and utterly fluid lines that ranked among the most beautiful anywhere. Perhaps unsurprisingly, the model was destined to become the summer driver of choice for the la dolce vita set. Within the United States, only a handful of Spider Americas survive in this quality. Fewer still have benefited from ownership by such knowledgeable and conscientious enthusiasts, who know quality when they see it. 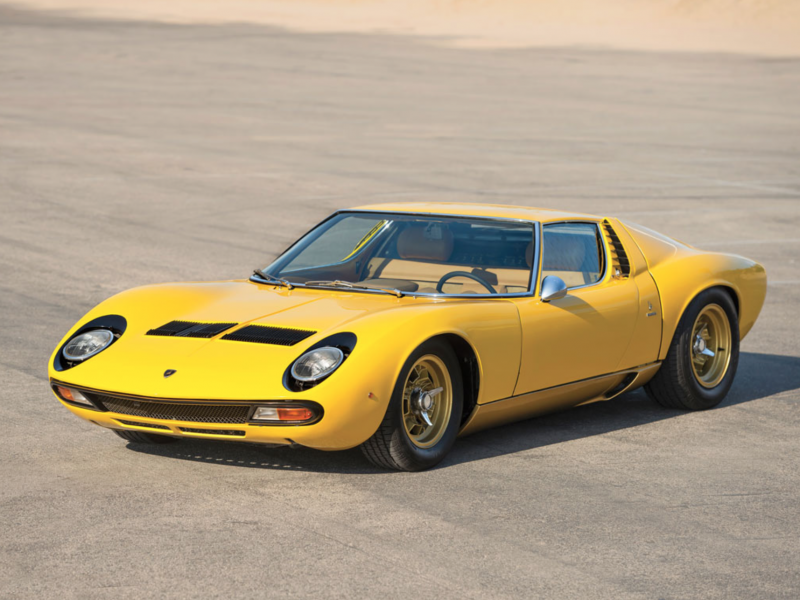 To many, the introduction of the Lamborghini Miura heralded the birth of the “supercar” as we know it. Prior to its introduction in 1966, there were, of course, many cars that offered incredible levels of performance and exclusivity to the privileged few, but there were none like the Miura. It offered a thrilling combination of not only performance and tremendous speed but also design and technical innovation that were meant to shock and awe. Surely one of the lowest-mileage Miura S’s known, and a desirable late-specification model benefiting from the best long-term ownership, this is an outstanding example of the original supercar. Born as a standard 289 Cobra, CSX 2093 went through many iterations as a racer until later in life when it was independently modified to Dragonsnake Cobra specifications. Of the factory and independently prepared Dragonsnake Cobras, CSX 2093 is unquestionably the most successful, so much so in fact that Shelby withdrew their factory support! By the end of its drag-racing career, it had established NHRA records in AA, A, B, and the C Sports classes and won a total of seven NHRA National events in addition to winning the NHRA World Championship with Ed Hedrick. Adding to its significance and rarity is that the car has been certified by the AACA as a true and correct original. Furthermore, it is also accompanied by a Letter of Authenticity from the SCCA further confirming the car’s authenticity and historical significance. Accompanying the car in the sale is a set of side curtains, two front chrome wire wheels, and a file of documentation with period photographs and time slips from its racing career. Compared to other racing Cobras, CSX 2093 is remarkably complete and remains the most successful Cobra in drag racing and one of the most significant competition Cobras in existence. The Cadillac offered here is distinguished from its sister Ghia coupe by its front-end design, which features a unique grille with thin vertical bars finished in gold-anodized aluminum, as well as no front fender parking lights, different taillights and rear license plate holder, and two half “bumperettes” rather than a full front bumper. 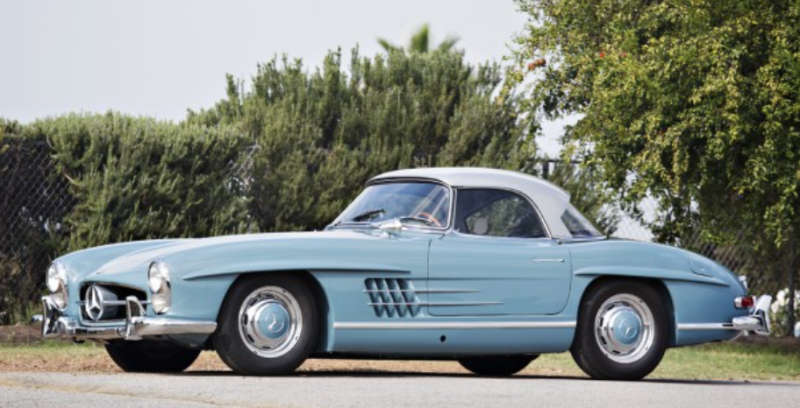 It was acquired by Don Williams of the Blackhawk Collection for its current owners some two decades ago; Williams recalls it as a solid original car that was then restored by the late Mike Fennel, the well-known restorer from Santa Clarita, California. The combination of great 1950s American chassis, engineering, and build quality with breathtaking Ghia design is a showstopper. 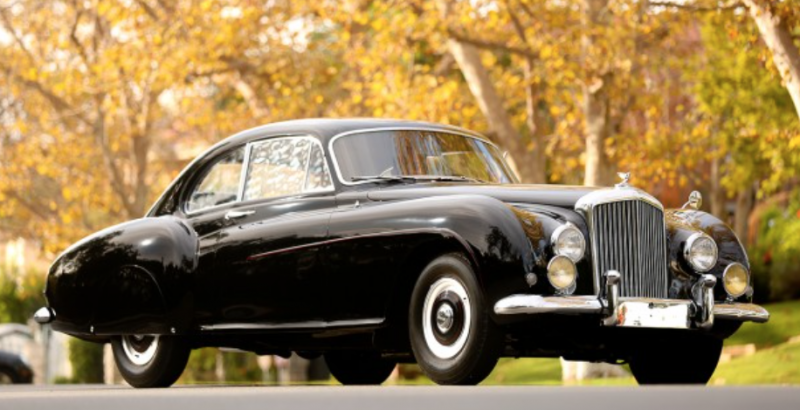 Desired by socialites of the era and wrapped in an air of romantic intrigue, this car ranks as one of the great coachbuilt creations of its age. The 300 SL Gullwing created a sensation when it debuted at New York’s International Motor Sports Show in February 1954. In the years since, it has earned a reputation as one of the most iconic automobiles ever released to the public. Mercedes-Benz built 1,400, and owning a Gullwing identified the caretaker as a true motoring enthusiast. As Gullwings continue to enjoy a unique status in the world of sports cars, they have become an increasingly popular choice with collectors on extended rallies and tours. Their legendary quality construction and performance make them truly exhilarating to drive at speed. 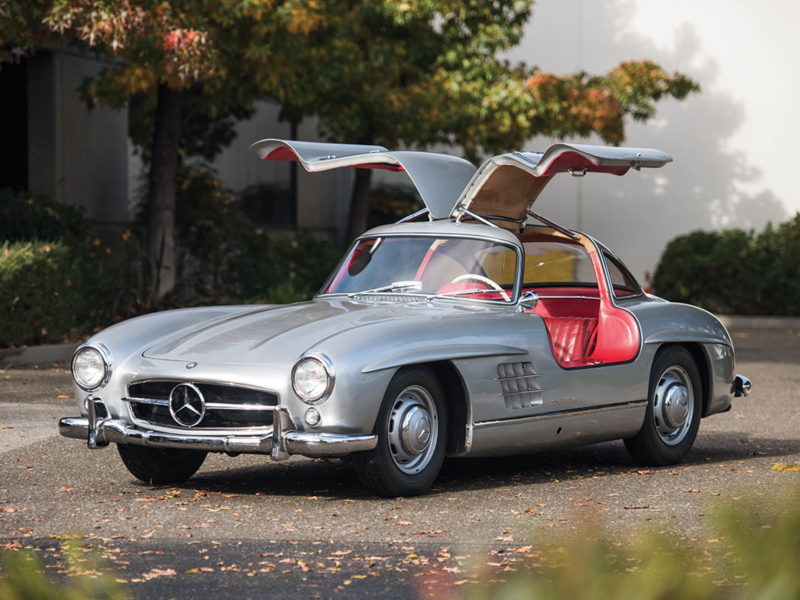 Presented here is a seldom-seen opportunity to re-introduce a beautifully restored Gullwing to the world, a generation after it last saw the road. In 1982, the FIA restructured its sports car classes, creating the famous Group B. Embracing a far freer formula than the preceding regulations permitted, Group B rules notably limited total engine displacement and reduced homologation production requirements. Enzo Ferrari envisioned an extremely high-performance competition car, and the resulting mid-engined coupe, the 288 GTO, utilized a lightweight steel-tube chassis covered with body panels of fiberglass, Kevlar, and aluminum. Pininfarina design chief Leonardo Fioravanti penned a body shell that was faultless in form, featuring curvaceously flared fenders, a deep front air dam, pronounced spoiler, and rear fender vents in reverence to the 250 GTO. 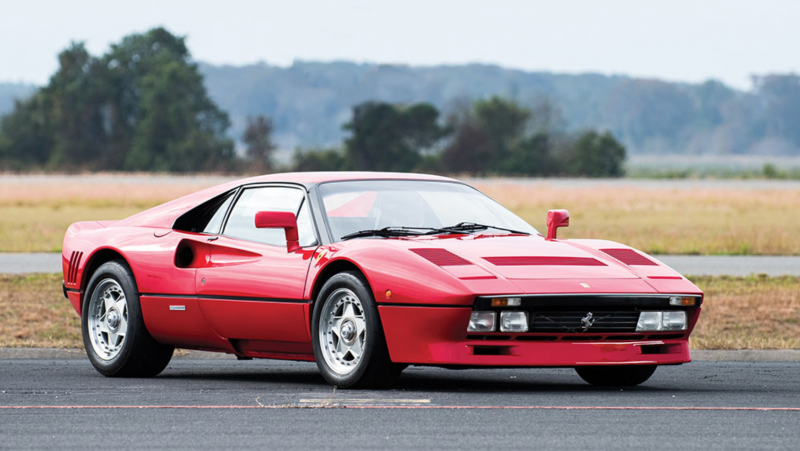 This sensational 288 GTO would be a crowning addition to any collection of modern supercars or Ferraris. It is a breathtaking embodiment of the GTO legend. While the earliest 166 Sports and Spider Corsas were successful in their own right, it was the 166 Mille Miglia – or MM – that dominated sports car racing in the late 1940s and early 1950s. In fact, the Ferrari 166 MM is the only car to win all three of the great European sports car races – the 24 Hours of Le Mans, the Targa Florio, and the Mille Miglia. Well-known and highly regarded among marque experts, this is a historically significant even-serial-number Ferrari that possesses every quality one looks for in a collectible automobile: aesthetic beauty, mechanical sophistication, exclusivity in numbers, a fantastic racing history, and exceptional provenance. With the vast majority of 166 MMs held in major collections, the appearance of 0060 M at auction may be a once-in-a-lifetime opportunity to acquire a stellar example of Ferrari’s first great competition berlinetta. Rare, powerful, and ferociously quick, Porsche’s stunning mid-engine Carrera GT was introduced at the 2003 Geneva Auto Show to immediate acclaim. Developed out of the canceled LMP1-98 prototype program, the Carrera GT, known internally as project code 980, was Porsche’s first supercar since the 911 GT1, and in all respects it was a showcase for the Stuttgart firm’s engineering prowess. Chassis 1967 GT is the 46th example of 202 second-series 250 GT cabriolets produced by Pinin Farina. 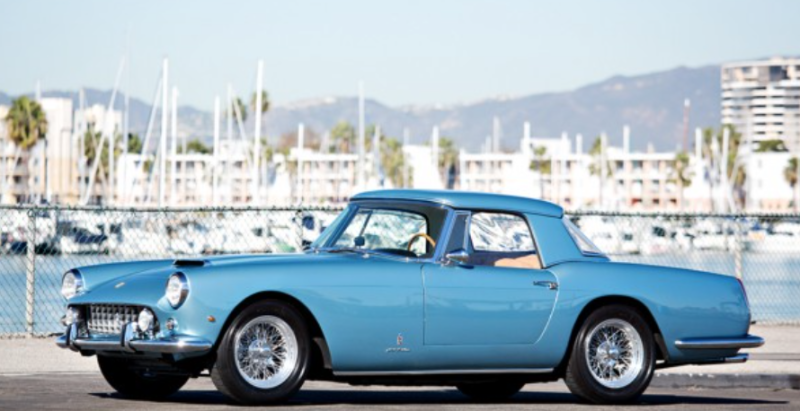 It claims a recent restoration to the original factory paint color, and a documented history of ownership including significant touring use, beautifully exemplifying the early open-bodied luxury Ferrari. This early example of the increasingly desirable second-series PF cabriolet offers show-worthy authenticity and presentation, and regularly serviced and tended mechanical elements. 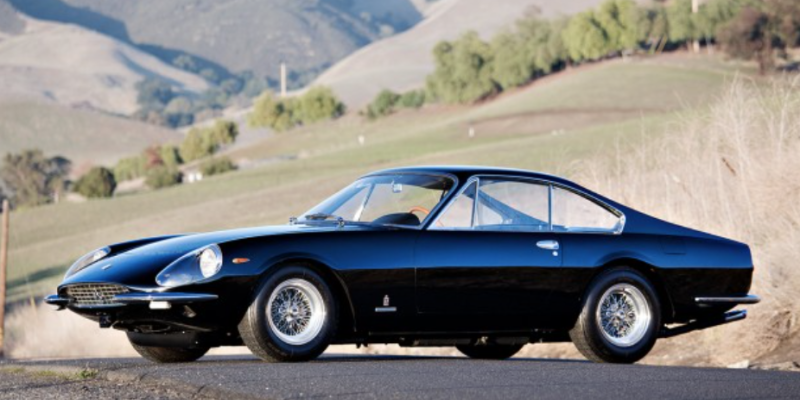 Clearly one of the most strikingly beautiful examples of the model, 1967 GT provides an excellent opportunity to join the exclusive group of open Ferrari 250 GT owners. Unveiled at the 1964 Paris Auto Salon, the Ferrari 275 GTB was the latest in the company’s long and distinguished line of high-performance berlinettas. Evolved from the preceding 250 GT series and influenced by Scuderia Ferrari’s contemporary prototype sports racing cars, the 275 GTB introduced a number of important mechanical innovations. Four-wheel fully independent suspension was a first for a Ferrari production car, and a new five-speed rear-mounted transaxle improved weight distribution and made for a more spacious cockpit. 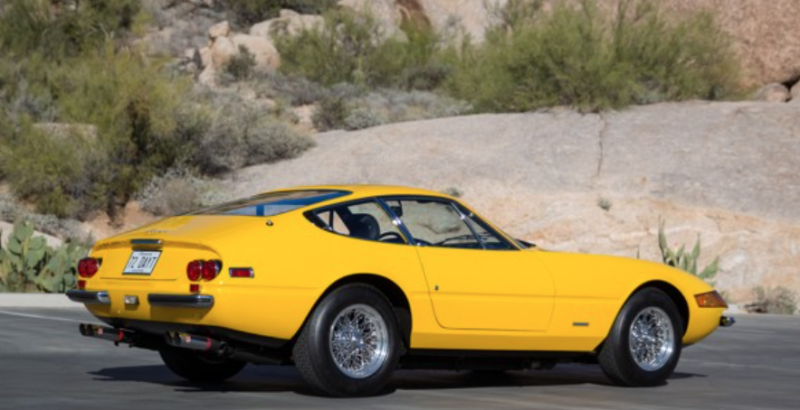 Powered by a 3.3-liter V-12 engine, the 275 GTB was capable of extraordinary performance and was among the fastest road cars of the era, with a top speed approaching 150 mph. Introduced in late 1929, the Duesenberg Model J effectively raised the bar on the entire automotive industry, setting a new standard in power, luxury, and exclusivity. “Duesenberg Model J” was synonymous with wealth, prestige, and privilege, and customers could have coachbuilders complete them to satisfy their every whim. 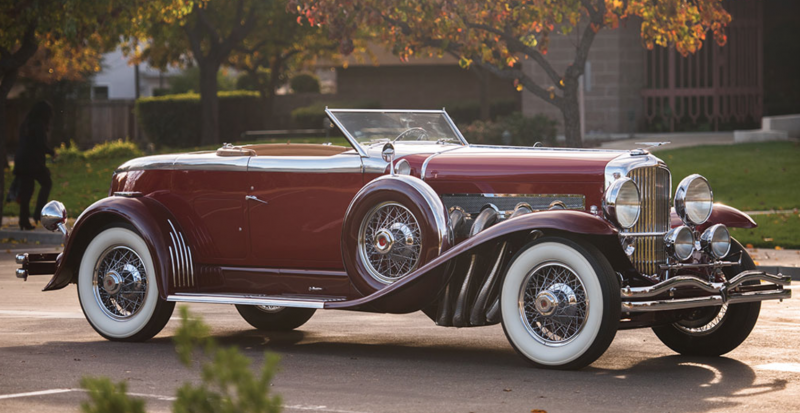 The LeBaron Dual Cowl Phaeton has been among the most coveted of all Model Js since the earliest days of car-collecting, and J-129 presents today as well as any Duesenberg ever has. It stands as one of the ultimate American classic cars of all time, among the very finest of its type, and is deserving of a place of honor in any of the world’s most refined collections. 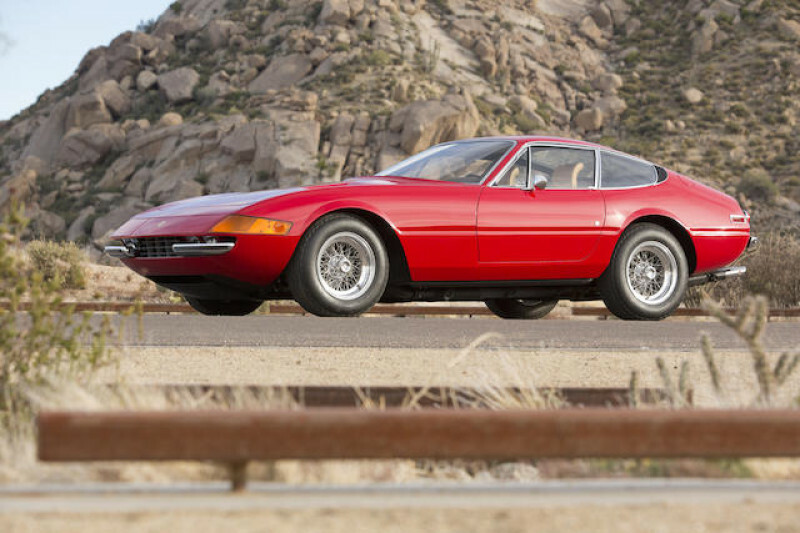 Debuted at Paris in 1968, the 365 GTB/4 succeeded the 275 GTB/4 as Ferrari’s new two-seat Grand Touring standard-bearer. Almost immediately, it was unofficially known as the “Daytona” in honor of Ferrari’s podium sweep at the 1967 24 Hours of Daytona, and it stands as the last front-engine, V-12 Ferrari GT model designed and announced before Fiat’s takeover of Ferrari road-car production in 1969. It was also the last 12-cylinder Ferrari officially sold in the US until 1984. Riding on Borrani wire-spoke alloy wheels with correct Michelin XWX tires and accompanied by original-specification Cromodora five-spoke alloy wheels, 15279 comes with owner’s handbooks and tool kit. This multiple award winner, which comes with the all-important Ferrari Classiche Red Book, stands as one of the finest Daytonas in existence. 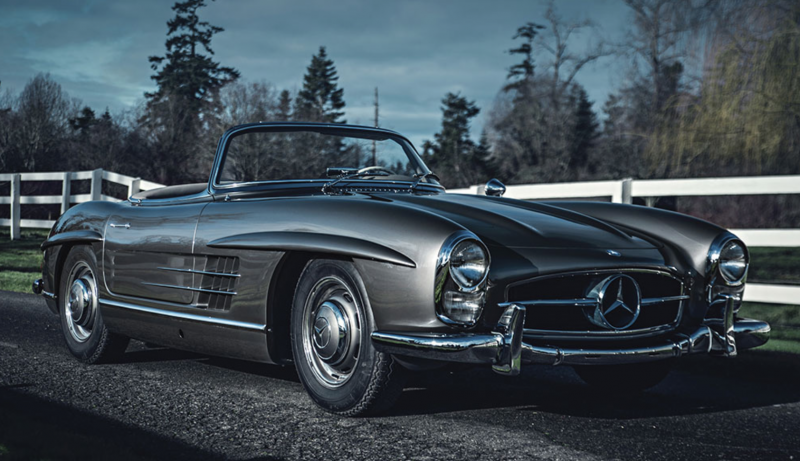 The 1957 300 SL Roadster presented here, together with the following lot – a 1960 190 SL – comprise a remarkable “his-and-hers” pair of Mercedes-Benz roadsters that have been parked side-by-side in a San Diego garage for more than two decades. Given its genuine character, unusual factory color scheme, and charming provenance, this 300 SL Roadster presents today as an ideal candidate for an exacting, concours-quality restoration. Significant 1950s sports cars in this condition do not come along often, and with the passing years it is increasingly unlikely that many unrestored 300 SLs will be found. 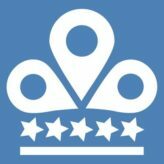 For the collector who has been searching for an exciting project with great potential for tremendous reward, this is truly the chance of a lifetime. The Ferrari supercar tradition truly took hold in the mid-1980s with the introduction of the 288 GTO, a twin-turbocharged V-8 powered berlinetta that was originally intended for sports car racing. This highly desirable F40 has furthermore been certified with a Ferrari Classiche Red Book, confirming its authentic presentation and the presence of the original matching-numbers drivetrain. The car is accompanied by the three-piece Schedoni leather luggage set, service records, manuals in the proper leather pouch, factory tools, and a car cover. Finer examples of the legendary F40 rarely become available, and this well-maintained low-mileage Ferrari offers serious collectors the opportunity to experience the track prodigy at its finest. Few modern hypercars have riveted the world the way the Ferrari Enzo did when it was introduced at the Paris Motor Show in October 2002. This sensational example of the ultimate supercar for the new millennium boasts low mileage and consistent maintenance by a short chain of dedicated caretakers, as well as Ferrari Classiche’s Red Book certification. Currently displaying approximately 2,700 miles, this desirable low-mileage Enzo retains the original V-12 engine, F1 gearbox, and major driveline components. The car is accompanied by a factory-original tool kit with fuses, tools, gloves and a wheel hub puller. It has also been fitted with a clear bra for optimal front-end protection from road wear. 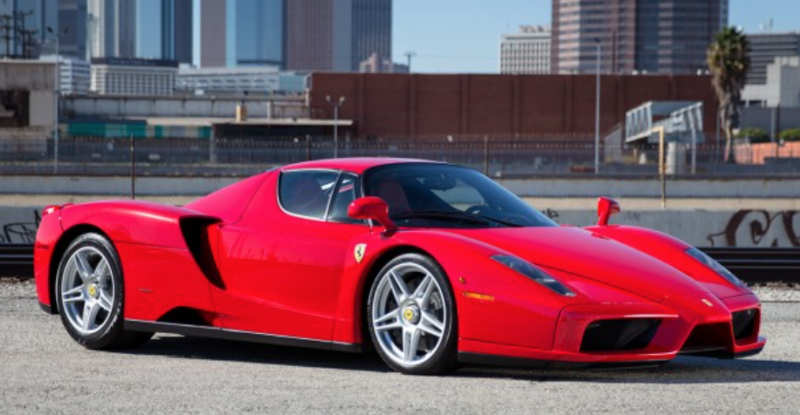 Still graced with the signature of Okuyama, this unique Enzo would make an important addition to any collection and would add significant cachet to any gathering of seminal modern hypercars. Benefiting from 26 years in the care of one owner, chassis no. 1939 GT claims an extensive restoration and documentation with factory build sheets, resulting in one of the most beautiful examples to be offered in recent memory. 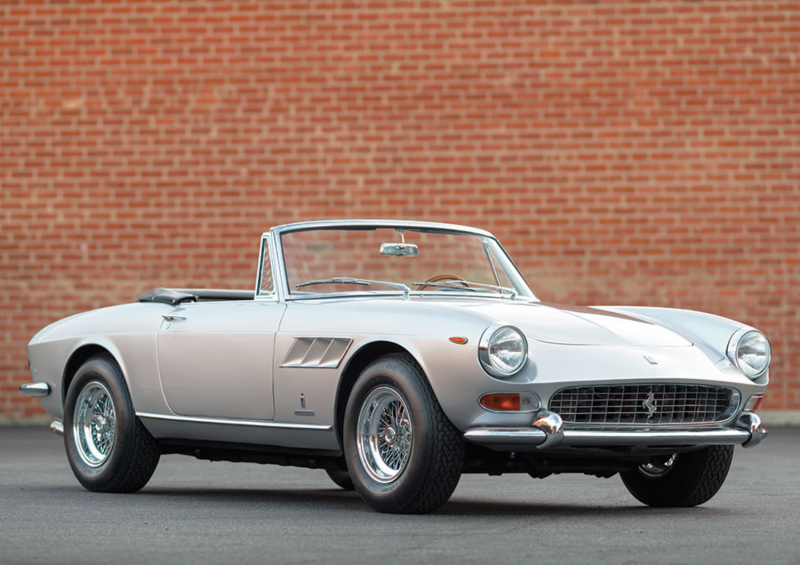 Following the success of the 250 GT Pinin Farina Coupe, Ferrari sought to distinguish the Scaglietti-built California Spider from the Pinin Farina-built cabriolets. With the mechanical advances made on the second-series Cabriolets, including the easier-to-service outside-plug 128 F engine, and disc brakes all around, this Ferrari combines modern driving qualities with vintage aesthetics. Whether the next caretaker prefers concours fields or the open road, this sensational 250 GT is sure to deliver a unique experience steeped in Maranello tradition and craftsmanship. Following the cessation of F40 production in 1992, it was only natural that Ferrari would engineer a successor to its 40th anniversary supercar. By most accounts, the 50th anniversary model the company introduced in 1995 represented an evolution in appearance and sheer performance. 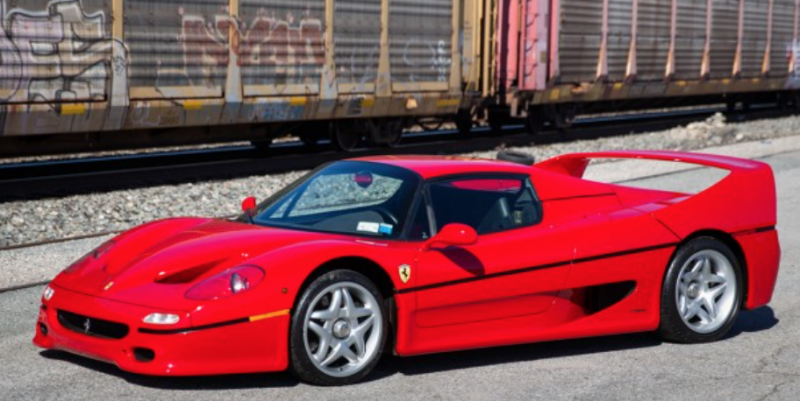 This important example of the F50 was not only used as a factory show car and promotional vehicle, but carries significant ownership provenance, Ferrari Classiche certification, and low mileage. Accompanied by the original factory hardtop, this Ferrari is also offered with books in the proper leather pouch, and the definitive letter of welcome from Luca di Montezemolo that was issued to all original F50 owners. With its Geneva and Tokyo Motor Show provenance, unique chassis numbering, and certification by Ferrari Classiche, this minimally driven F50 is a paragon of the vaunted supercar that would crown any collection. 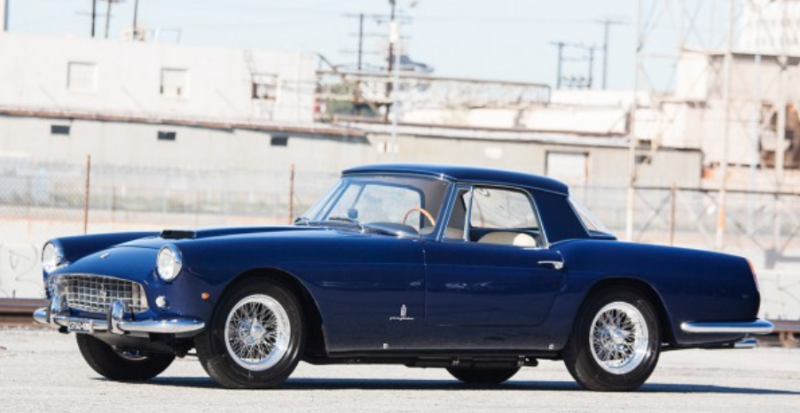 It is a magnificent and highly desirable example of the classic 50th anniversary Ferrari. By most accounts one of the handsomest designs ever produced in the series, the Ferrari 250 GT/L, or Lusso, is one of those rare automotive icons that encapsulates both the finest in styling and engineering. Chassis no. 5537 GT claims both a recent cosmetic restoration and a long period of single ownership, resulting in one of the finest Lussos to become available in some time. For the enthusiast who wishes to indulge in the most advanced of the road-going series 250 GT ever built – the direct relative of the 250 GTO racecar, no less – the well-tended V-12 and plush leather interior await, sure to deliver a supremely rewarding grand touring experience. Such beautifully prepared Lussos rarely come to market, and this outstanding car, which has benefited from regular attention, promises its future owner a blue-chip example of one of automotive history’s most celebrated grand tourers. With DNA rooted in the 300 SL racing cars of 1952, which successfully returned Mercedes-Benz to top-level international competition and scored a commanding 1-2 finish at Le Mans that year, the breathtaking 300 SL Coupe debuted at the 1954 New York Auto Show to widespread acclaim. 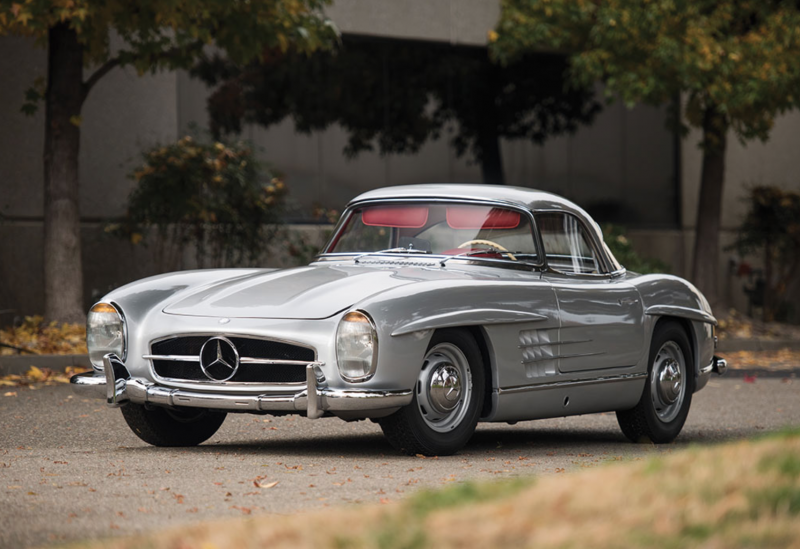 Demand for a roadster variant spurred development shortly after Gullwing production began, with German magazine Auto Motor und Sport reporting the first sighting of a modified open 300 SL at Stuttgart in 1956. While 300 SL Gullwing production wound down in mid-1957, with 1,400 built in all, production of the comprehensively refined 300 SL Roadster commenced. Just 1,858 300 SL Roadsters were constructed through 1963, with the model largely hand-built. Using the Mark VI chassis – re-designated “R-Type” in 1952 – as the prototype’s basis, its 4.5-litre inline six-cylinder engine was conservatively but effectively tuned and mated to a four-speed manual gearbox with overdrive top. A numerically low 3.077:1 final-drive ratio was selected for high-speed cruising at low engine revolutions. H.J. Mulliner was commissioned to produce the Continental bodies in lightweight aluminum, further unlocking the Continental’s performance in concert with aluminum window frames, windscreen surround, backlight, seat frames, and bumpers. By the mid-1960s, the fundamentals of the automobile business were such that boutique firms – such as Ferrari and Pininfarina – were forced to turn from exclusive handmade series to volume production. The combined effort, expense, and talent that went into the development of models like the 500 Superfast and 365 California Spider were monumental, particularly in light of the extremely limited numbers built. Those with an appreciation for the prestige, glamour, and sophistication embodied by an extremely limited-production Pininfarina-built 330 GTC should recognize the appearance of this exceptional 1960s Ferrari as an opportunity not to be missed. This McLaren P1 number 371 is the last US-market P1 built of the 375 total production-run. P1 number 371 remains in essentially brand new condition, and has covered less than 300 miles from new. 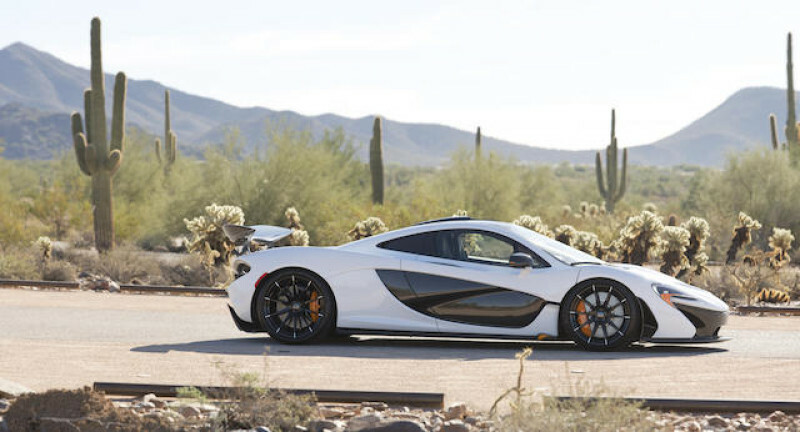 This car was originally shipped to McLaren Chicago around New Years 2014/2015, before the cars first owner, a Florida-based enthusiast took delivery. The new McLaren P1’s option list totaled nearly $100,000, and included the Alaskan Diamond White used tastefully throughout many parts of the cars high-tech exterior, as well as the sharp and neatly contrasting orange line used in many elements of the interior. The P1 comes complete with all its factory delivered accessories; including the custom-built sculpture model of the car, carbon fiber key box with the spare key, tools and books in the leather pouch, leather binder with plaque, car cover, window sticker, fire extinguisher and charging station. This numbers matching 300SL has been driven less than 93,000 miles since new, this rare, alloy block and disc brake 300SL shows extremely well. Finished in the original as-delivered color combination of Fire Engine Red over Black hides, with a black soft top, it is certainly one of the finest 300SL alloy block and disc brake Roadsters one could purchase, and retains the original drivetrain including the engine, as well as body panels and chassis. The car is offered with copies of the Mercedes-Benz factory built sheets, books and tools, and is ready for use on rallies or tours, or to be displayed at Concours events. Mercedes-Benz commission number 40926, with chassis or wagen number 35813 and engine number 60793, was delivered as bare chassis to Carrosserie Saoutchik on August 23,1928. The cars history from here until the post-war years remains vague, but the car is believed to have been in the US, and possibly Ontario, Canada for a very long time. The 630K has been beautifully restored throughout some years ago, and is elegantly finished in a duo-tone bluish grey color, neatly complimented by the finest hides and fabrics in the exquisite Saoutchik cockpit. 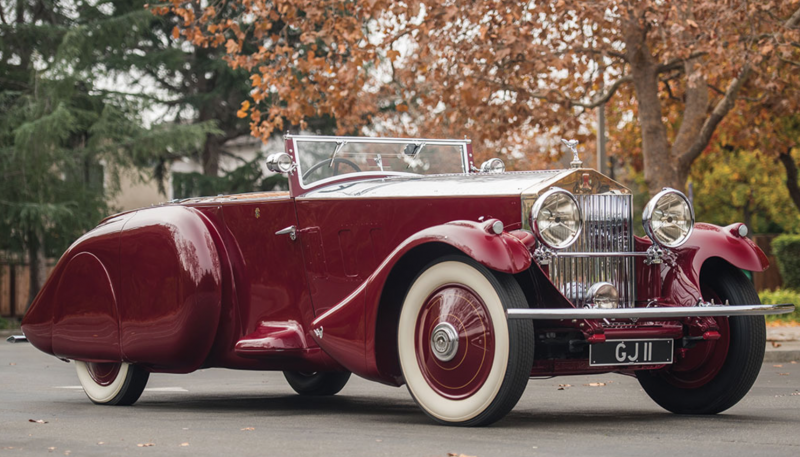 A welcomed entry to the finest and most prominent Concours d’Elegance around the world, this Saoutchik La Baule Transformable being offered for sale is an opportunity not to be missed. Wearing aluminum coachwork penned by Bertone’s Giorgietto Giugiaro and built by Piero Drogo’s Carrozzeria Sports Cars in Modena, the A3 Competizione was a spectacular vision with aerodynamic flair. The results were an impossibly low and wide car that was exotically curved from evry angle. In an effort to avoid the complications of engine production, Iso utilized a 5.3-liter Chevrolet Corvette engine in all of its cars, which was tuned for racing in the A3/C. The big-block motor was sunk far behind the front axle, giving the car a competition-worthy mid-engine layout that optimized weight distribution. 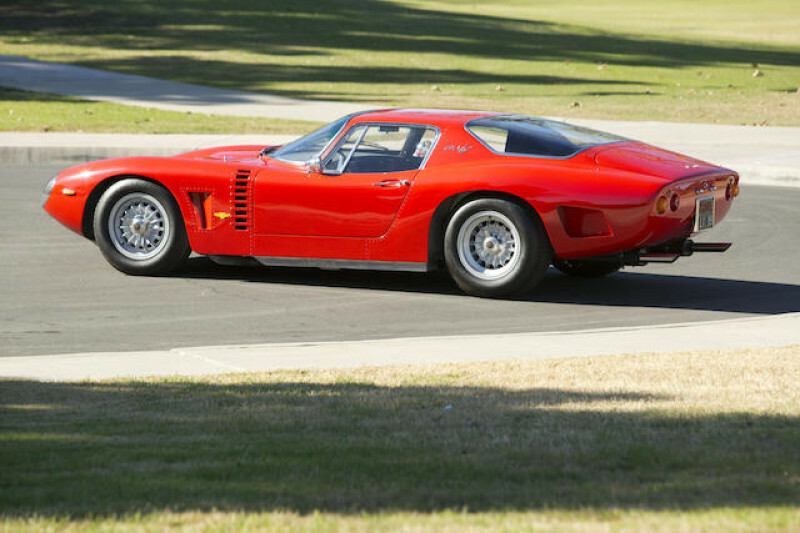 According to some historians, Bizzarrini described the A3/C as the second coming of his GTO, and a more refined one at that. Completed on April 2nd, 1971 this 365 GTB/4 Daytona Berlinetta left the factory in new Rosso Chiaro 20-R-190 paint and Beige VM 3218 leather interior with Black seat inserts. The car was equipped and destined for the US-market, and optioned with air conditioning. This superbly presented example of a low mileage Daytona Berlinetta must be one of the best available anywhere. It is offered with both Campagnolo alloy wheels, and the Borrani wire wheels fitted to the car, as well as a full tool kit and full array of owner’s manual and books in the pouch. With just over 8,000 miles from new, documented ownership history and exquisite presentation and mechanical condition, this Daytona is ready for FCA judging or a national level concours exhibition. This magnificent automobile is a fabulous expression of two names that together to most people represent what the legendary Edwardian era Rolls-Royce 40/50hp was, being a ‘Silver Ghost’ and ‘Roi-des-Belges’. The first, the apt name originally applied to one of the earliest of the model built, reflecting its silver painted coloring and whisper quiet engine, the second, the voluptuous coachwork style famously preferred by the monarch of Belgium, distinctive for its separated front seats and sculpted body that ‘steps up’ and out from front to back. The fabulous DB5s that emerged from the Aston Martin factory at Newport Pagnell in the mid-1960s were hand-built, stylish, powerful and quite expensive; bespoke grand tourers – “the essence of GT driving”, noted one reviewer in 1964 – that drew admiring glances wherever they were seen. 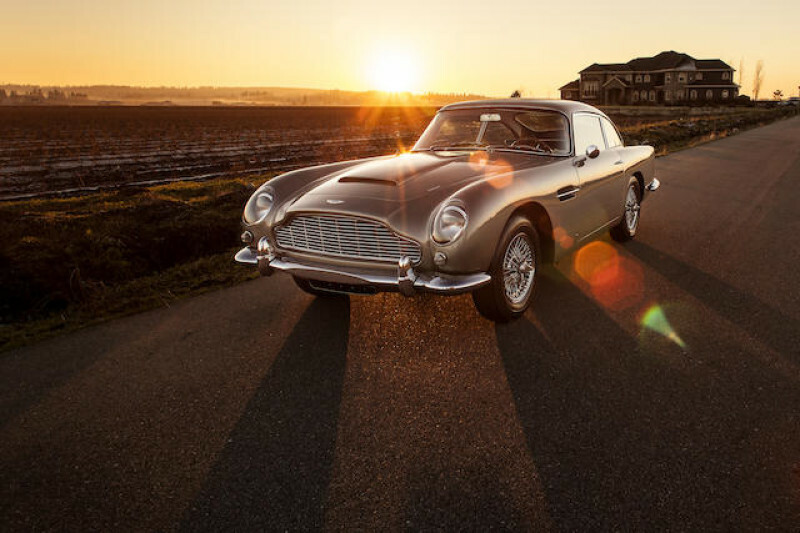 The DB5’s supporting role in the James Bond film series cemented its image as perhaps the most famous automobile in the world. Many became the favored rides of celebrities worldwide. This stunning DB5 Saloon was a home-market model (right-hand-drive), built on 28 October, 1964 and sold by to Plough Motors Limited, Stonehouse, Gloucestershire for Holders of Congresbury, Somerset. It was originally finished in Dubonnet Rosso with a Fawn leather interior. But has been completely and extensively restored to one of the finest examples of the mark available.